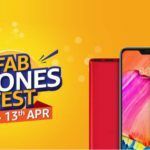 If you're on the lookout for a Redmi 6, Redmi Y2, or a Mi A2, then this festival is the time to buy these at discounted rates. While the biggest sales festivals take place before Diwali in India on online portals like Flipkart and Amazon, it doesn’t cease to exist in other months. In fact, there’s now a good discount festival always around the corner if you’re looking for one. Speaking of which, we’re in the last month of 2018 and Xiaomi is kicking off the “I Love Mi” festival on Amazon.in for potential buyers. India’s number one budget smartphone seller had a stellar month on the back of a buying frenzy fueled by Diwali. 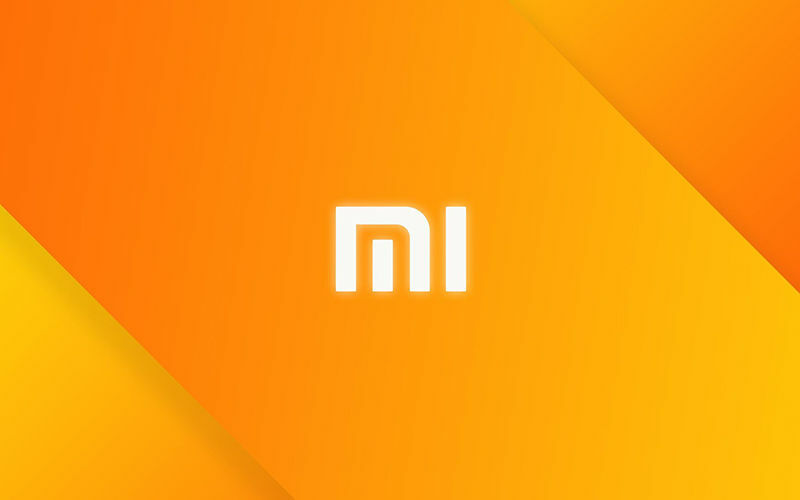 In fact, Xiaomi single-handedly dominated online sales in the festive season with 43 percent share followed by Realme, as per a study by Counterpoint Research. The smartphone maker recently announced the Redmi Note 6 Pro in the Indian market. 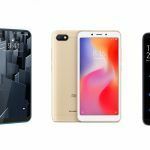 However, the “I Love Mi” sale encompasses three devices – the Redmi 6A, the Redmi Y2, and the Mi A2 with Android One. Sales will start on December 6th at 12 PM and 3 PM respectively and the festival will continue till December 8. The Redmi 6A recently received a price hike along with several other products when Xiaomi was forced to adjust margins due to an increasingly weak rupee. The Redmi 6A price was hiked in November by Rs 600 for the 2GB +16GB version and RS 500 for the 2GB + 32GB version. After the price rise, the former costs Rs 6,599 while the latter costs Rs 7,499. The handset previously went on open sale on the portal. 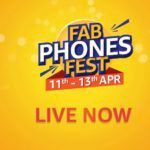 At the festival, the handset will be sold at its original debut price which is Rs 5,999 which is a sweet deal for the entry-level handset. The Redmi 6A is equipped with a MediaTek Helio A22 chipset. 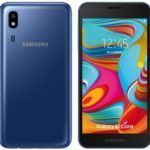 It has a 5.45-inch IPS LCD HD+ display with a notch design and a 3000mAh battery. For photography, the device has a 13MP rear shooter and a 5MP front shooter. It comes with Android Oreo on board topped with MIUI 9. As opposed to the Redmi 6A, Xiaomi dropped prices of some of its smartphones supposedly to celebrate top position in the Indian market last month. 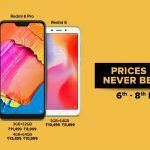 This price drop included the Redmi Y2 along with the Mi A2 and Redmi Note 5 Pro as well. 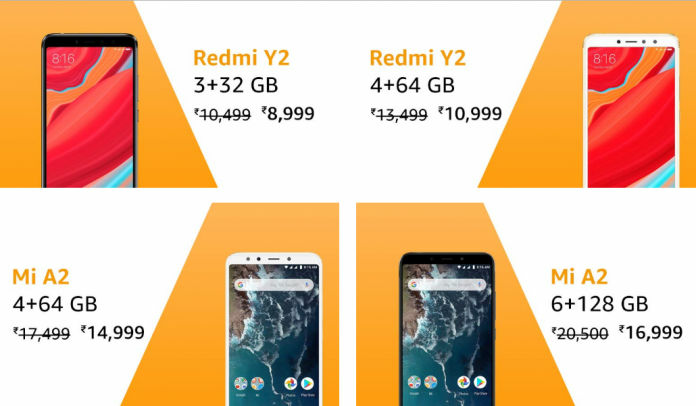 For the Redmi Y2, only its top variant – the 4GB + 64GB version was discounted by INR 1,000. That brought down the price of the handset to Rs 11,999. 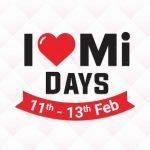 Compared to that, there’s another INR 1,000 discount on the same variant at the “I Love Mi” festival. The handset was also on sale at the Great Indian Festival sale for Diwali last month. The Redmi Y2, launched in May this year, has a modern 5.99-inch 18:9 display with HD+ resolution. It also rocks a much better Snapdragon 625 SoC compared to the Redmi 6A and 4GB of RAM. The handset was aimed at selfie-takers and hence has a 16MP front camera and a 12MP + 5MP dual rear camera combo. The battery at 3000mAh is on the smaller side but the handset does have a matte finish metal design and a fingerprint reader at the back. The Mi A2 price was also dropped in the same pretence that the Redmi Y2 was discounted in November. Except that all variants of the Mi A2 were discounted instead of just one by INR 1,000. The Mi A2 is the most premium of the lot and comes with a more potent Snapdragon 660 SoC, a 5.99-inch Full-HD+ display. It also has an impressive array of cameras with the rear toting a 12MP + 20MP combo and the front getting a 20MP solitary shooter. However, it fails to impress in the battery department with a measly 3000mAh battery and also lacks a 3.5mm headphone jack. For more info, you can visit the source (Amazon) link below where you will also find all the details regarding the sale.